Its the time of the year I dread the most - exam times. Food will be mostly takeouts, or instant sandwiches or M's dal for some days. Since this blog is not about takeouts, already has M's dal and though the quick sandwiches totally deserve to be here, I'm trying my best to find time to put on proper clothes and comb my hair and maintain a sane house. While I'm busy doing that I have planned a series of guest posts from some of my favorite people on blogsphere. I hope you enjoy it! I might even pop in with a quick something in between, so stay tuned. When I was only days old to food blogging, I came upon the Indian food blog ecurry. It was the first Indian food blog, which I honestly thought was doing justice to Indian food. From personal stories, Indian food culture to Soma's pictures, I immediately fell in love with everything on ecurry. A few months later we were connected through other social media and to my surprise not only was a fabulous cook but one of the most down to earth, kind and helpful person I came across in blogging world. You can imagine my joy of having her do a guest post on Journey Kitchen. Well, here I'll tell you - I'm smiling from ear to ear. I was in the midst of a rocking good time polishing off the last one of our first boxful of mangoes, when Kulsum wrote to me and asked if I could do a guest post for her. Well, “of course” I said, and started brainstorming right away for a recipe with mangoes. We found one another probably a year back and have been in touch via our blogs, email and the other social media. It is not just the blog that keeps her busy, Kulsum is a student too, deftly managing a home, school and a blog baby all at the same time. While I lived in India, almost half of my life, I had never heard of the Bohra Cuisine. It was from Journey Kitchen that I got introduced to this unique cuisine. I would like to thank Kulsum for inviting me to guest post in her blog. Summer conjures up delectable memories – numbing silence in the late afternoons and the heat of the sun, the shade under the huge banyan tree, summer vacations, playing hide and seek in the sultry afternoons and mangoes! A parade of mangoes take place in India from April to early July. The fruit starts trickling down slowly into the market in the late spring and makes it with a blast during the summer months when we hear, see and smell only mangoes. Different varieties come by at their own times; in different colors and sizes. We partied with mangoes; not one or two, but buckets of them, immersed in cold water. Well those days are over. Also gone are the days of spending days in the sprawling mango orchards, walking from one plantation to another picking mangoes straight from the trees. These were all parts of summer vacation and seems quite surreal now. But the memories of sucking out the pulp of the smaller mangoes from a tiny hole made at the tip, while the juice dripped down our wrists and then the elbows, will remain vivid forever. This is something which I would love to do all over again. Kulsum requested a breakfast/brunch kind of recipe. What sparked right away was a mango pancake, with some cream – a breakfast? a dessert? I am not sure. So I wrote back to her and she immediately agreed. While growing up, the ripe mangoes were consumed mostly just by themselves. No one ever thought of cooking with them, except for some occasional recipes once in a while, like the Aam Raas (kind of a mango shake) or Srikhand (mango juice combined with yogurt) and sometimes Chutney. But there is intense pleasure playing along with the fabulous spices and flavors from India! A blend of saffron, cardamom and cream is exquisite. And finally when you marry the above ingredients with some luscious ripe mangoes, you end up with plateful of a blissfully lavish and exotic tropical brunch. Note: If you are not fond of the cream, just use regular Maple Syrup or a Mango (or any fruit) compote with the pancakes. 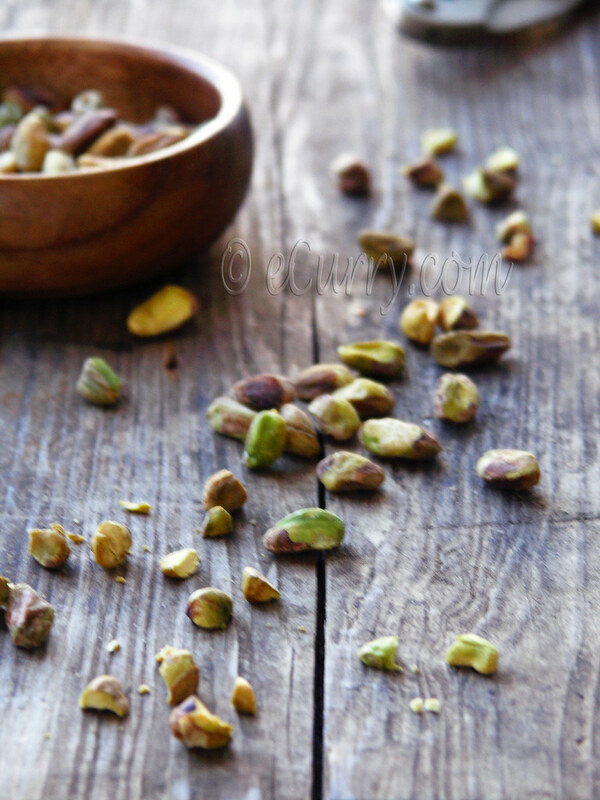 Remove the seeds of the cardamom and grind them into a fine powder. Use about 1 cardamom (seeds powdered) per cup of cream. 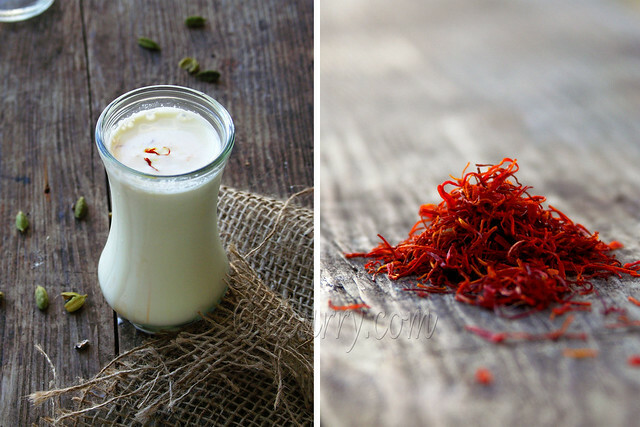 Combine saffron with the warm spoon of milk and let it sit for 15 minutes until the saffron infuses the color in the milk. Combine the milk with the cream. Add sugar and cardamom powder and whisk/whip for about a minute till it thickens a little bit, but still has the flow like a syrup (If you want to drizzle your pancakes with the cream). OR if you want to layer your pancake, more like a tall sandwich with the cream in between, whip the cream till soft peaks forms and holds the peak. You can prepare the cream any way you want, there are no rules. Cover and set it aside in the refrigerator and allow it to chill. It is a good idea to leave it overnight for the flavors of the saffron and the cardamom to infuse with the cream. If you want thinner pancakes, use more milk to make a runny batter. Sift together flour, baking powder, sugar, and salt. In a separate bowl, whisk together the egg, milk, melted butter and vanilla extract or the cardamom powder; add to flour mixture, stirring only until smooth. Blend in melted butter. If the batter seems too thick to pour, add a little more milk. Add one cup of chopped mango to the batter and save the other cup to top the pancakes while serving. Cook on a hot griddle greased with melted, using approximately 1/4 -1/3 cup of batter for each pancake. Cook until bubbly, a little dry around the edges, and lightly browned on the bottom; flip and brown the other side. Repeat with the rest of the batter. Stack the pancakes. Top then with the rest of the mango. Garnish with nuts. Serve with chilled cardamom saffron cream drizzled on the top. You may also layer the whipped cream between the stack of pancakes, or stuff the pancakes (when you make them thin- crepe like) with the whipped cream, mango and nuts. looks rich and delicious !!! What a magical pairing! And the textures here look marvelous! Oo, that looks and sounds absolutely delicious! I haven't tried cooking with mango much either. And your mango memories of India sound wonderful. These are different from any pancakes I've ever had. Saffron and mango?? I'm in!! Beautiful clicks!! And yes one more way to use mangoes!! this could easily pass as a dessert! a sophisticated one! great job with both recipe and photos! This indeed looks soft and delicious. We have discovered sticky coconut rice with mango slices. Now anything with mango sounds good to me. Holy yum! Pancakes, mangoes and cream? Decadence! :) That looks scrumptious!!! I love your blog and I love Soma's so I think it's fabulous that you've collaborated here. The pancakes look delicious...I've never thought to add mango! I love the idea! How amazing is that saffron?? 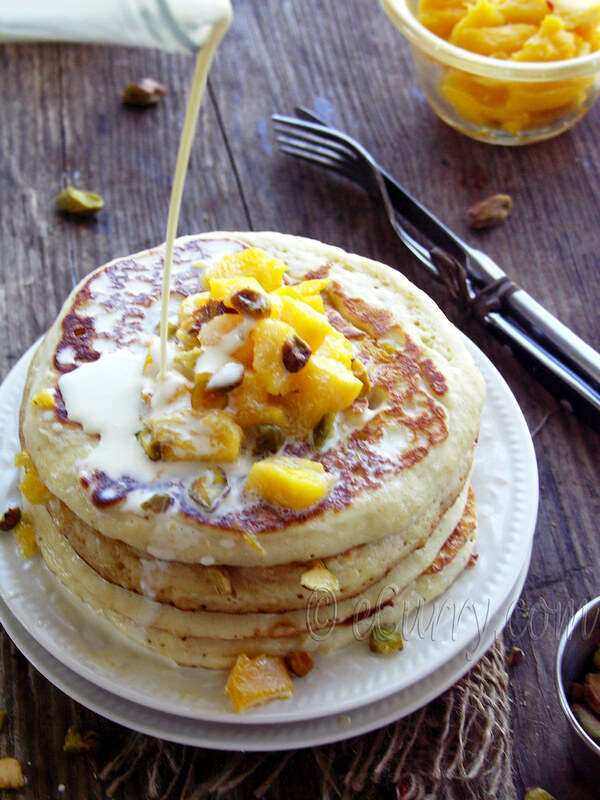 Mango pancakes sound gorgeous. Will have to try them in summer this year! Kulsum thank you much for inviting me over. Sukaina: :) they were thick, but tiny - even smaller than the pics shows maybe! All the photos are so tempting but that last shot is the one that just made me want to reach out and grab that plate! What an amazing breakfast. @Soma Thank you thank you for being a guest on Journey Kitchen. This is beautiful! 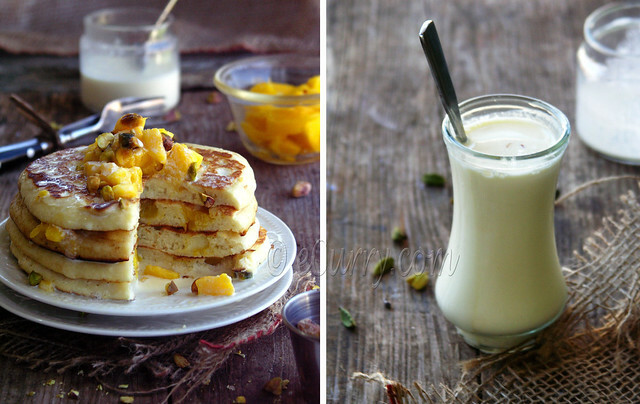 Love the mango, saffron and cardamom anchoring this gorgeous breakfast. Yum! Oh holy yum! Those pancakes look and sound amazing! A fantastic guest post bringing 2 of my favorite bloggers together! Love your vivid writing and beautiful clicks, Soma! Exam time? Dreadful!! Looks like you would be all drowned in studies..All the best my friend! I remember you mentioning abt M's dal and the famous dhungar :) Enjoy not cooking for a while!! these are a wow . . . and if you can believe it, i have 3 mangos sitting on my counter looking for a home . . . pancakes, here we come!! All I can say is WOW! 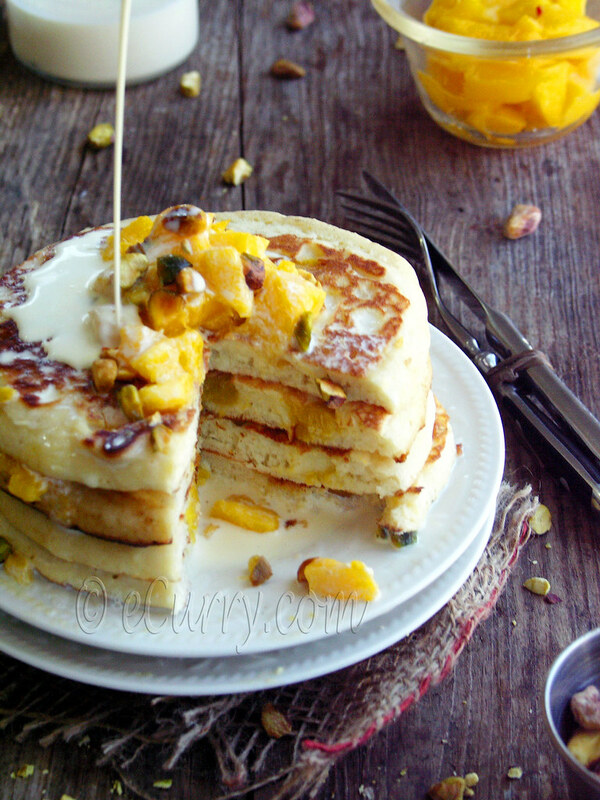 Mango pancake sounds like something I HAVE TO make, and teh saffron cardamom cream....just phenomenal. I wouldn't be able to come up an idea like that and that's why I love visiting food blogs! Thanks for sharing and great guest post! amazing!! 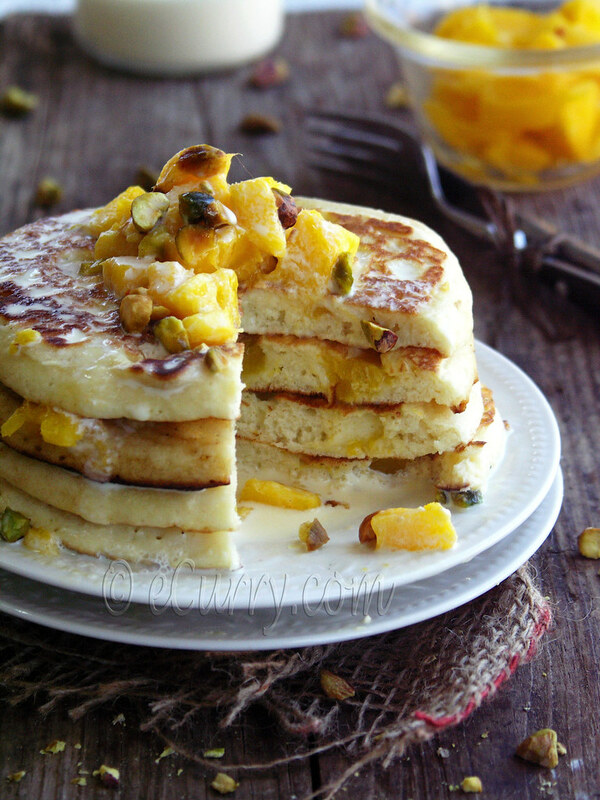 love anything with and about mangoes, what a loving and stunningly looking pancakes...yum! I love cardamon. Unfortunately mangos are out of season here in Australia but i am sure i could find a substitute. The weekend is here and it is my birthday on sunday and i am putting this on the request list. Wow. I love the combination! I can't wait to try this. Exotic breakfast!!!! And fabulous photography!! 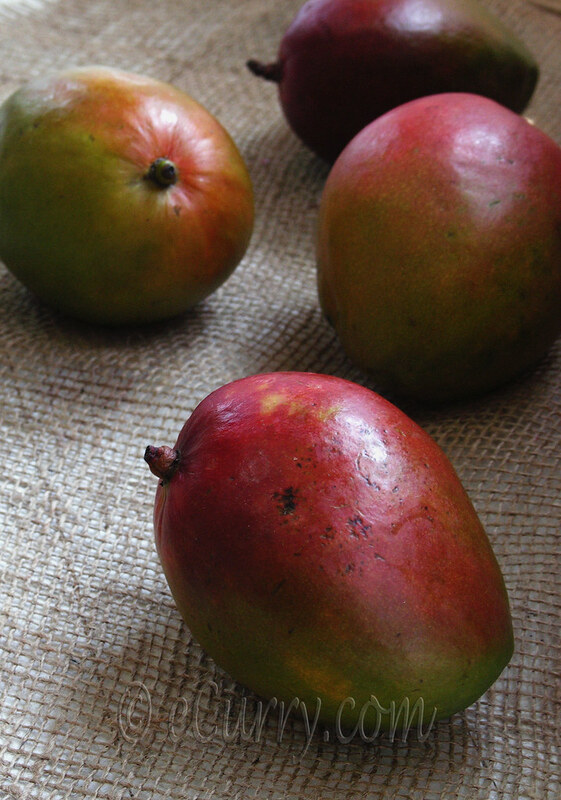 I adore mangos and can't wait to have them back in season! These sound perfect! Oh you torture me with these pancakes! They look light, flavorful... and loaded with texture! That's just how I like my pancakes! Totally, awesomely, delectably droolworthy!!!!!!!!!! Lovely post, lovely food, lovely blog! I'm addicted! & SO making this a sunday breakfast! SLURP!! !